As you may know, I'm being kicked out of my craft room. You see, our home is just a little 3 bedroom rambler so I knew it was inevitable that if we ever had another kid (which was in the master plan), I'd have to clear all my stuff out of the 3rd bedroom to create a nursery. It is certainly a bittersweet transition. 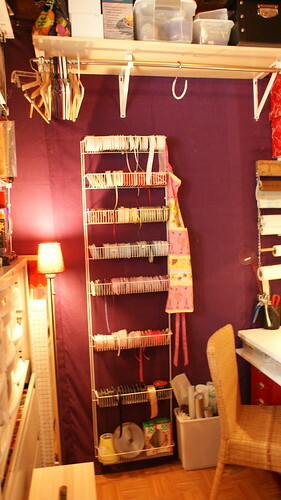 Here's a post I did just a few months ago (before I got pregnant) featuring my fabulous craft room. 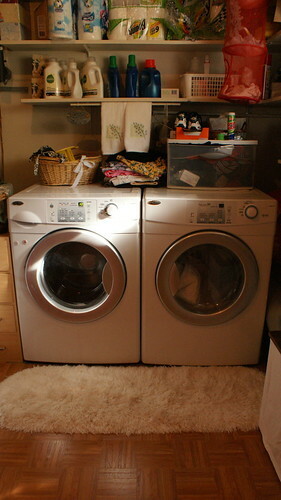 My first step in the transition was to make some room in the laundry area out in the garage to start moving my craft stuff there. 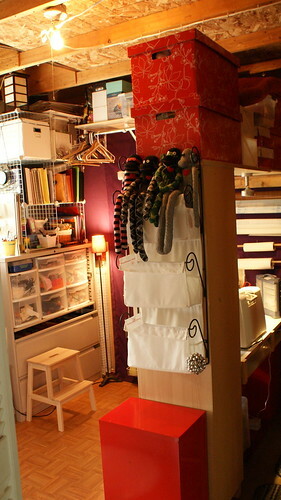 Next, I hauled all the craft stuff out of the closet and created a "cloffice" because the garage isn't temperature controlled so I knew the computer and printer couldn't be moved out there. 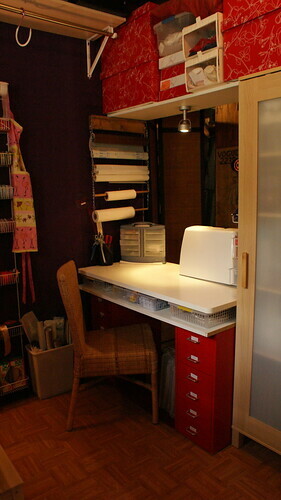 The last step was to get all my stuff out of the craft room and to set up a new craft room. If you've seen either of my two Wordless Wednesday posts, you may have noticed things got a lot worse before they got better. Wondering what that is? 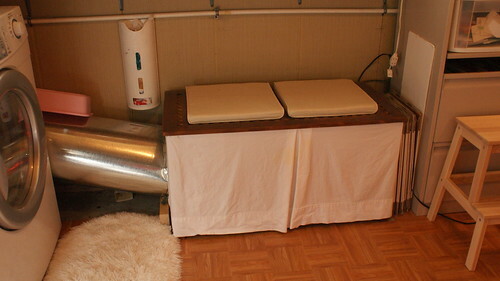 We started with the Ikea Hol storage bench, cut a hole in one end, attached the HUGE venting to it, ran that venting up to the wall next to the dryer where there's a cat door leading to it from the corner of the dining room. 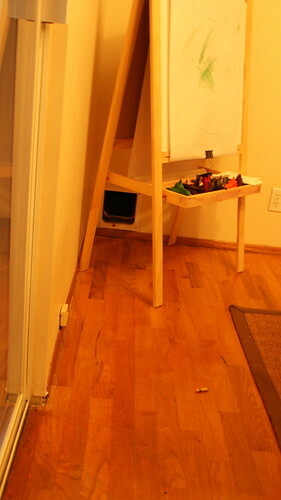 So there you have it, my new craft space (and an oddly yellow picture of the corner of our dining room). It isn't the best but it is my own and it is tidy, well organized, well lit and cheerful. I'm not sure what I'll do in the winter when it gets cold out there but necessity is the mother of all invention so I'm sure I'll work something out. 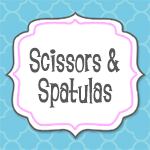 Do you have your own craft space? Is it your own room or a corner carved out somewhere? I'd love to hear about your space and see pictures if you have them. Feel free to link up in the comments. Like your "cloffice" I have a "claft" area. LOL. All my stuff is in a closet off the dining room and I just use the dining room table to work on.... The joys of a small house. Everything needs to be multipurpose! You said it!!! My brain actually enjoys the space planning of a tight home (although I bet it would manage to find other challenges in a bigger home). Sure, I don't get to redecorate and my mantle can't be adorned with holiday goodness because the only place to put the TV was over the fireplace but organizing is fun so that's my focus. I have always loved puzzles and this is like living in a real live puzzle. I totally missed one important aspect of my craft space - I actually do have a window which looks out to one of our rose gardens so that's a major plus. BTW, I actually sat at my sewing machine this morning. I did the first draft of a maternity shirt. I'll do another one in the next few days and post at tutorial. It was easy even if it did end up way too small. No kidding! What were they thinking? I mean, I get that we might only need 3 bedrooms but how about 3 bedrooms and a craft room, THAT is logical. We built a bonus room out in the garage but my husband got first dibs so he can go out there to play music. It never made sense to have him playing in the house after our son goes to bed so he got his own room. My space isn't bad but it'll get chilly in the winter.